Baxter State Park is a world-class wilderness area where resource protection comes first. The Park was a gift to the people of Maine from former Governor Percival Baxter, who wanted it to remain forever wild. All facilities within the Park are rustic and without electricity. There is no potable water in the Park. Plan to bring potable water or a means to purify water from local sources. Baxter State Park has a carry in / carry out policy. All garbage and trash must be carried out. Pets are not allowed in Baxter State Park. Use of any soap or detergent or the disposal of food scraps in the streams or waters of the Park is prohibited. Transporting any firewood into the Park is prohibited. Firewood is available for sale in the Park. There are no stores within the Park to purchase gas and other supplies. The Park is extremely rugged and remote. Rescue may be a very long time in arriving. Camping is allowed only in designated sites. All sites require a reservation prior to camping. Travel on I-95 to Exit 244; turn west on Route 157 and travel through Medway, East Millinocket and Millinocket. Proceed through both traffic lights in Millinocket. (If you wish to stop at Park Headquarters, it is near McDonalds at the first traffic light in Millinocket.) Bear right at the three-way intersection after the second traffic light in downtown Millinocket. Bear left at the next “Y” intersection, staying on the main road. Route 157 ends in Millinocket, and the road to Baxter State Park has many names: the Baxter State Park Road, the Millinocket Lake Road, or to locals, simply "the Lake Road." Eight miles from Millinocket, you will pass the Big Moose Inn and the Northwoods Trading Post on the right. Continue another 8 miles on a paved road to Togue Pond Gatehouse. Travel on I-95 to Exit 264; turn west (left) on Route 158 which shortly joins Route 11. Bear right on Route 11 and travel 9 miles to Patten. Leaving Patten, leave Route 11 and turn left on Route 159, the Shin Pond Road. Continue 26 miles on this road to the Matagamon Gatehouse. 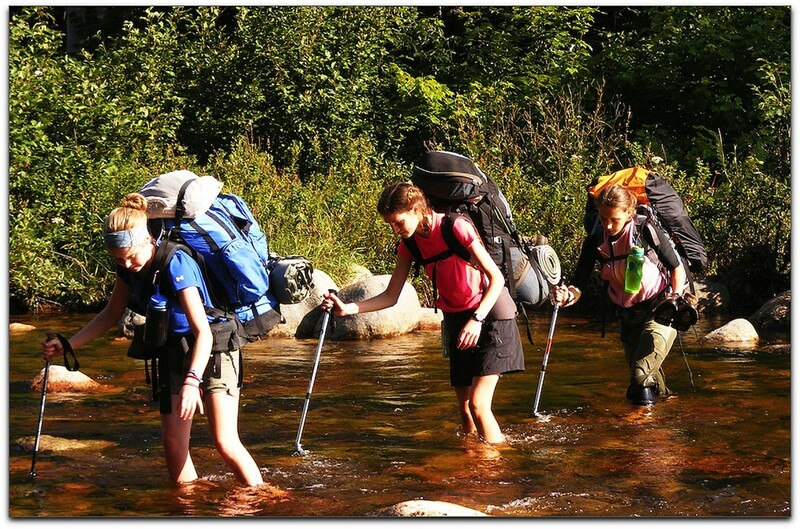 GPS units are notoriously unreliable for navigating to Baxter State Park. Park Headquarters is located at 64 Balsam Drive, Millinocket, Maine 04462. Headquarters is 18 miles from the south entrance at Togue Pond Gate and over 60 miles from the north entrance at Matagamon Gate. Roads in Baxter State Park are unpaved and narrow. Most sections of road are one lane, requiring one car to pull to the side when two vehicles meet. The speed limit is 20 mph or as posted. Entrance permits are provided at the Park gate. Permitted vehicle size is limited to 9’ high, 7’ wide, and 22’ long for single units or 44 feet long for combined units. Motorcycles, motorized trail bikes, and ATVs are not allowed. Bicycles can be used on all roads in Baxter State Park, as well as on the Dwelley Pond Trail. Bicycles are not permitted on trails. Baxter State Park's 220 miles of trails draw hikers from around the world. Trails range from easy walks over flat terrain to steep climbs above treeline that require scrambling and the use of hands. Choose a trail that fits the ability of everyone in your party. When climbing mountains in the Park, remember that your destination is not the summit - your destination is a safe return to the trailhead at the end of the day. Set a turnaround time and stick to it. Hikers should wear appropriate footwear and clothing and must carry a working flashlight. Children under the age of 6 are not allowed above treeline. Groups of minors (under age 16) require supervision of one person 18 years or older for every five minors. The maximum size of hiking groups is 12 persons. Affiliated groups on the same trail separated by less than one mile are considered one group. Your vehicle will take you to several campgrounds, so your choices of what to bring are limited only by your imagination or the carrying capacity of your car. Fresh water or a means to purify it is a must. If your goal is one of the walk-in campgrounds or remote campsites, weight and utility will dictate careful choices in gear, food, and clothing. If you plan to do any hiking or mountaineering, ankle-high boots or rugged shoes with firm soles— broken in before you come — offer both comfort and protection. If you stay in a lean-to, bunkhouse, or cabin, your gear needs will likely be centered on eating and sleeping. With a lean-to, you can cook over a wood fire (except at Chimney Pond and Davis Pond) but you will have greater flexibility if you have a camp stove. Stoves and extra fuel are a necessity if you are at a bunkhouse or cabin. You must supply all pots, pans, dishes, utensils, and a means of water purification. Sleeping bags, pads, or mattresses are needed except at Kidney and Daicey ponds where mattresses are provided. Tentsites near a car or boat allow a wider choice in the size of your tent; tent weight determines the limit when backpacking to remote sites. A big fly or tarp is a welcome shelter over a cooking area during bad weather. The Park does not allow nails in trees or lean-tos. The Park has a carry-in/carry-out policy. All non-burnable waste must be carried out. Keep garbage to a minimum and store it in animal-proof containers in your car or hanging from a bear line. Pets: No pets or other domestic animals are allowed in the Park. Firewood: Baxter State Park does not allow ANY firewood to be transported into the Park. Firewood is available for purchase at all campgrounds. Power Equipment: Chainsaws, generators, and other power equipment are not allowed. Electronic Devices: The use of audio or visual media devices in any way that impairs the enjoyment of the Park by others is prohibited. Hypothermia, the “progressive physical collapse and reduced mental capacity resulting from the chilling of the inner core of the human body,” can occur even at temperatures above freezing. Temperatures in the Park can drop rapidly. Exposure to frigid bodies of water and sudden mountain storms can turn a pleasant day into a life-threatening experience. Be prepared! Many stream crossings do not have bridges. Particular care is needed where water flows over a ledge since the rock may be extremely slippery. The water level in streams can rise rapidly in storms, making crossings difficult or impossible. While it is safer to travel the backcountry in company with another, it is not required. If you do plan to go solo, let someone, preferably a ranger, know your plans and expected time of return — and check in when you do return. Be sure to use the hiking register. Special rules apply to winter solo use. Tiny black flies are the first biting flies to appear in the spring, and then even tinier no-see-ums or midges. By June, mosquitoes show up, slacking off toward autumn. Fortunately, black flies quit at sundown; unfortunately, midges and mosquitoes do not. In deep summer, green deer flies and larger black moose flies happily chew on unprotected skin. Most insect repellents also protect against ticks. Lightning is most hazardous above treeline but is dangerous anywhere. If caught in the heights, seek a low spot and squat down, making yourself as small as possible. Groups should spread out to avoid multiple victims. Metal frame packs should be removed. Do not lie down. Below treeline, move to shelter or, if in the woods with no other option, take shelter under the shorter trees. Stay away from water or wet places. Most backcountry stream crossings in Baxter State Park are unbridged, requiring wading or rock-hopping to cross.